President Dwight D. Eisenhower congratulates Korean War veteran Army Staff Sgt. Hiroshi Miyamura after presenting him the Medal of Honor. His award was kept secret for his safety until after his repatriation in August 1953. Only five Korean War vets who earned the Medal of Honor are still alive. One of them happens to be former Army Cpl. Hiroshi Miyamura, who is just one of a handful of Asian Americans who have received the nation’s highest military award. Miyamura grew up as a second-generation American in Gallup, N.M., in the 1920s. But during World War II, he and his family were some of the many Japanese families in the U.S. who were sent to internment camps because the government was afraid of their loyalties – whether they were with Japan or America. Miyamura was determined to show his allegiance to the U.S., so in 1943, at age 18, he joined the Army’s 442nd Infantry Regiment, an all-volunteer group of Japanese-Americans from the internment camps who had made a name for themselves as being one of the most decorated in military history. Miyamura trained as a machine gunner and was ready to go to battle, but the war in Europe ended just as he arrived in Italy. Miyamura came back to the states, got married and worked for a few years before his services were needed in the Korean War, a conflict for which he volunteered. In April 1951, Miyamura was in charge of a machine gun squad in Company H, 7th Infantry Regiment. They were part of the frontlines guarding Seoul, South Korea, from an enemy assault by the Chosin Reservoir, an area that had already seen major battle the year before. Miyamura and his 15 soldiers were ordered to hold the defensive line near the Imjin River. On April 24, thousands of Chinese soldiers attacked their position. “It seemed like there were just thousands of ants marching across the frozen river toward us,” Miyamura told a crowd at an Asian American & Pacific Islander Heritage Month event in 2010. Miyamura tried to evacuate his squad and was quickly injured by a grenade. Despite losing a lot of blood, he jumped from his position and charged, killing several enemies with his rifle and then its bayonet after it jammed. He made it back to his machine gun as another assault came through, and he kept firing, giving his men time to retreat. In all, he killed more than 50 enemy soldiers before he ran out of ammo. 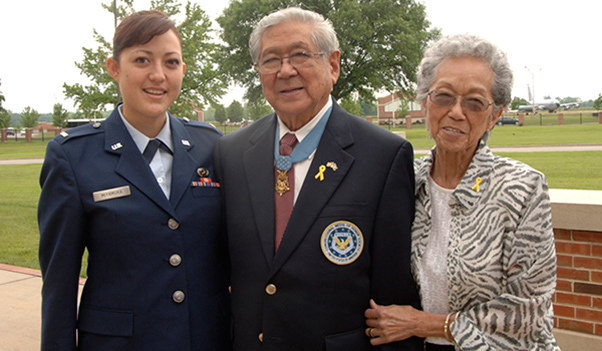 Medal of Honor recipient Hiroshi Miyamura is flanked by his granddaughter, Air Force 2nd Lt. Marisa Miyamura, a communications officer assigned to Scott Air Force Base, and his wife of 62 years, Terry. Miyamura tried to retreat, too, but he lost consciousness from the blood loss before he made it to safety. When he woke up, there was a gun to his head. He was forced to march for a week with no food to a prisoner-of-war camp, where he was held captive for 28 months. Miyamura said he suffered from dysentery and starvation and often dreamed of food while in captivity. He said at first, his captors tried to brainwash him and the other prisoners into becoming communists, but it didn’t work, so they eventually gave up. On Aug. 21, 1953, he and the other prisoners were released. It was a moment Miyamura said he almost couldn’t believe – especially because he also found out that he’d earned the Medal of Honor. The award had been kept secret for his safety until he was repatriated. 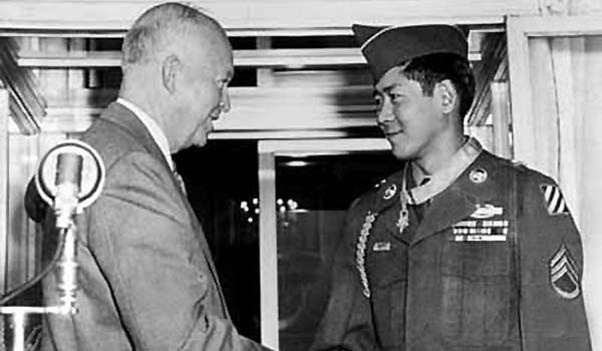 President Dwight D. Eisenhower presented Miyamura with his medal two months later, after he had some time to recover and reunite with his family. The corporal had also been promoted to the rank of staff sergeant. Miyamura went on to have three children and four grandchildren, including one who is currently an officer in the Air Force. He is now 92 years old.